As rates of infection of MRSA rise dramatically among children, BBC News Online talks to a mother whose son contracted the "superbug". Baby William Osborne may be only seven months old but it has been a dramatic few months in his short life. He got bronchiolitis soon after birth and then spent months in and out of hospital as doctors tried to find out why it was not clearing up. 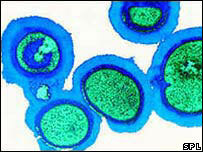 It was eventually discovered in March he had developed MRSA, from which he seems to have just recovered. His mother Katie, 34, from west London, believes he picked up the bug at a hospital in early December and it should have been detected straightaway. She said: "We were in despair thinking he would be sick all the time or even die. My baby has gone through all these invasive tests when a nose swab would have done the trick." Her son was first admitted in November last year when only eight weeks old. He had breathing difficulties and was coughing up mucus. The hospital diagnosed him with bronchiolitis and he was discharged. What followed was a period of baby William being in and out of hospitals in London and - on a family holiday - New Zealand and Singapore. Eventually on 8 March, a bronchoscopy in London established he had MRSA. Mrs Osborne, who has two other young children, said: "There was a flurry of activity to get him off the ward. Men with masks came to take down the curtains from his bed. "He'd been on the ward for two days by now, with babies that are very susceptible to this kind of infection. "I was just shocked and wanted to speak to a doctor." William was put on an antibiotic called Vancomycin which was infused through the neck and he immediately responded well. 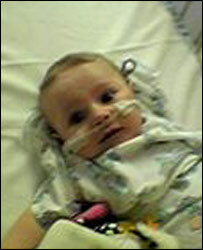 His chest soon cleared and he became "a normal baby" again, said his mother, who hopes now her baby's problems are over. But she wants to know why he got the bug and why it was not picked up earlier. "We want to know why no-one tested his sputum which seems to me, as a non-medical person, like commonsense. "I was even asking staff to test his phlegm but I wasn't listened to, yet I knew there was something else (other than bronchiolitis) going on. "There are implications for the hygiene of the hospital and the hygiene of the doctors and nurses," she said. Mrs Osborne, a BBC journalist, said: "This has ripped our family apart because I hardly ever saw my husband through this. "I was meant to return to work in January so it has financially crippled us." Soon after the MRSA diagnosis, the Osbornes remembered William had been tested for the superbug while in New Zealand. They rang the hospital and were told the test had returned positive, but they had not been told. That meant their son had the bug on 21 December and his parents believe he probably caught it earlier in the month in London. They are considering legal action against the hospital concerned.